Lawrence C. Taylor, Jr., MD is the founder and leader of Brandon Eye Associates. He specializes in cataract surgery, after cataract laser surgery and has been in private practice since 1985. 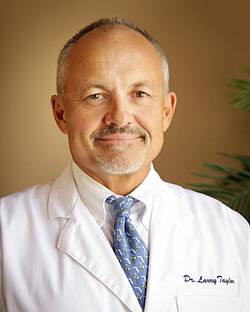 Board Certified by the American Board of Ophthalmology, Dr. Taylor brings a wealth of experience to our practice. Away from the practice Dr. Taylor enjoys spending time with his family. He loves boating and is a real fisherman! Born in Rochester, Minnesota, his family’s travels brought him to Florida in 1970. Here he earned his bachelor’s degree from Florida Southern College and his medical degree from University of South Florida where he was elected to the national honor medical society, Alpha Omega Alpha. He also received the Upjohn Microbiology Award. He completed his internship at Greenville Hospital System in South Carolina. He returned to Florida to complete his residency at the University of South Florida. Dr. Taylor opened his first practice right here in Brandon and began building his reputation as a knowledgeable and skilled physician. During this time he was also Clinical Assistant Professor of the Department of Ophthalmology at the University of South Florida. Today his dedication to the field of ophthalmology is known throughout the community. He is trusted by many loyal patients who continue to see him for their complete eye care needs, as well as many peers who are confident to refer their patients. He maintains his membership with the American Academy of Ophthalmology, American Society of Cataract and Refractive Surgeons and has served on the board for the Tampa Bay Ophthalmic Society as secretary/treasurer, vice president, and president.